86,5 x 76 cm (approx 34 x 30 inches). 32 inches. 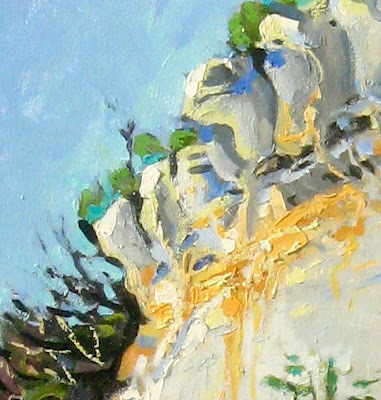 Have you noticed how large oil paintings look kind of far away or difficult to see in small sized jpg’s on the internet ? Wilst small paintings tend to look close up & gain in imapct on the internet @ 500 pixels largest dimension… so see above image for a detail which isn’t life-size but it gives you a better feel. In the upcoming solo show at Galerie Ap’Art in Marcilhac sur Célé , Lot, (4 July – 31 July. 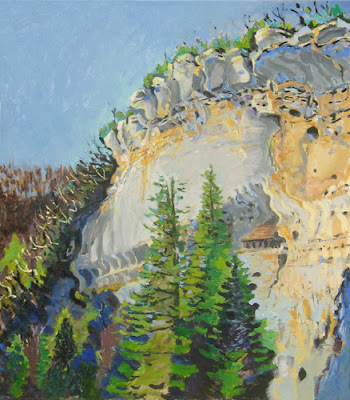 Vernissage – lundi soir 4 Juillet ), I will be showing some of my cliffs & rock paintings. These are my favorites that you paint. Wonderful! the cliffs are yr favs?